our little family: We've moved! I have been absent from my blog without explanation this summer. But, really, there is a good explanation. Mostly I was lying by the pool chatting with my friends. And reading books. Lots of them. Really good ones. I spent so long doing it that my rear actually got sore from sitting too much. Not kidding. Scott didn't believe me (and neither did I at first), when I would walk up our stairs and say, "Why am I so SORE? I haven't been DOING anything! It must be those chairs at the pool!" When I wasn't at the pool, I was packing for a move. A temporary move, but none the less, a move that kept me busy in the afternoons. Just this week, Scott, the girls and I left for Mexico. We're planning to spend almost a year here, north of Puerto Vallarta which is on the west coast of Mexico about halfway down the coast. We came for one main reason: we want our children to experience immersion in a second culture and language. Scott and I have a strong desire to raise our children with an open mind toward other ethnic groups and cultures. That is an easy thing to talk about but not usually an easy thing to experience in most suburban communities in America. We also believe very strongly in the benefits of second language learning, especially for children, and Mexico was a convenient destination for us at a convenient time. Scott has the luxury of a flexible employer (at least for now) and the girls are young enough that they will get the full benefits of language immersion without missing out on much academically. They'll be enrolled in a Spanish-speaking school here and I can (hopefully) catch them up on whatever they don't learn here that they'll be expected to know when we get home. Hopefully Brynn's first grade math is easier than long division. Otherwise I'll be in trouble. 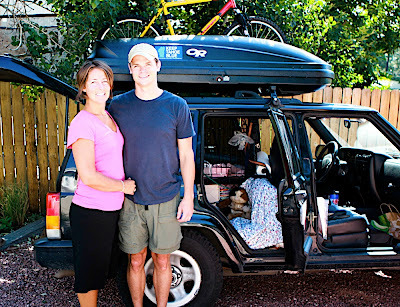 Notice Scott's bright red and yellow mountain bike atop the Jeep. It's ten years old and kind of a rough ride but it garnered many compliments during our drive, from awed children and security guards alike. By our first stop for gas (which wasn't very far down the road, since we left with only 1/4 of a tank) we noticed that the right rear tire was quickly getting covered by the right rear fender. That side of the car was apparently quite a bit heavier than the left. It also happens to be the side where Libbie and I were sitting, but I'm SURE we weren't the cause. We first noticed the problem while Scott was on the phone with his dad (Scott has many talents, but driving while talking is not one of them). We hit a dip on the freeway while going too fast and heard a spine-chilling scrape from the back right tire. At that point I wondered how much of the back end of the Jeep we'd lost. Eventually Scott figured out how to take his foot off the accelerator at just the right time to avoid more scrapes. That only worked, though, when he noticed the dips and bumps in time. We can always count on her to give...um...not a whole lot of effort to anything that resembles work. What a princess. The sweet girl lined up all her flip flops so we wouldn't forget to take them. 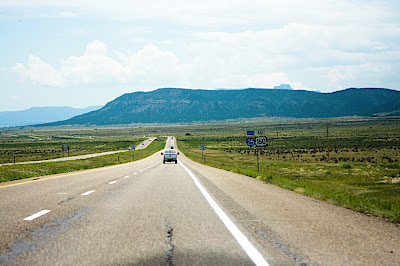 Here's a photo from the road in New Mexico. Don't let all the green fool you. It was HOT. And Scott's air conditioning only works intermittently. I thought New Mexico was gorgeous. Actually, so was Arizona and the Sonoran desert. All of them were beautiful and what I started to realize, as we drove across this vast landscape, was that pretty much all of nature is beautiful. In fact, I can't think of anything that God created that doesn't have some sort of natural beauty. We saw plenty of ugly sights along our trip, but all of them were man-made. The natural landscape, on the other hand, was breathtaking. It just made us both smile. So typically Mexican. Which made me even more excited about our journey to come. 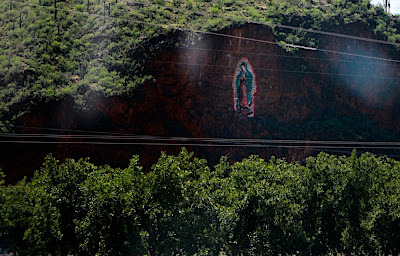 We saw a lot of these signs on the second day of our trip as we drove south on 15 through Sonora. We had to laugh every time we saw one because, generally, we had LOTS of hassles in that zone. It was certainly not hassle-free. There were the teenage boys jostling for position as they tried to clean our windshield at every stoplight, for just a few pesos, of course, but the problem is that they attack your windshield with washer fluid without asking. 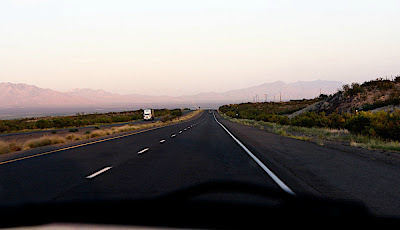 There were the "topes" (TOH-pays) in every town, which are tall, skinny speed bumps, usually several in a small section of road, that keep you from speeding through towns but, if you're driving an overloaded Jeep, the topes require you to come nearly to a stop to get over them safely. Or risk losing a right rear fender. There was also the hassle-full immigration stop where we had to go back and fourth to the same guy three times while ferrying our immigration papers between a few different offices. 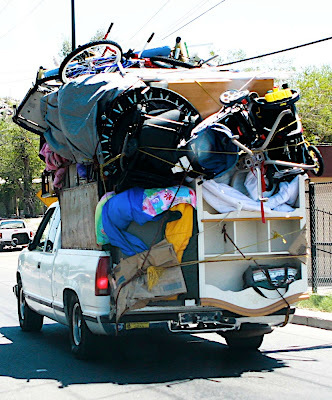 Although, I have to say, the immigration process could have been a LOT worse, considering all the stuff in our car. 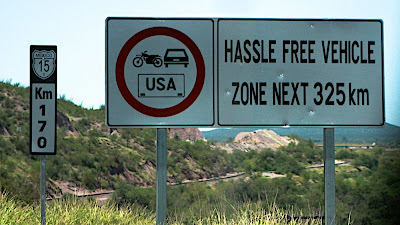 We eventually figured out that the hassle-free signs mean that, if your car is registered in the U.S., you can drive through that zone without a Mexican Auto Importation Permit affixed to your car. You won't get "hassled" by the Mexican cops. So I guess, in that respect, it was quite hassle free. In many others, it was not. But overall it was an easy drive. Agave plants. 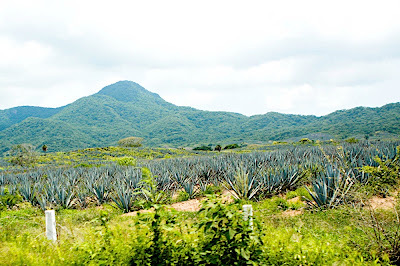 We're living just north of Jalisco (hah-LEES-koh) which is the only Mexican state that can officially call the alcohol derived from Agave "Tequila." But the Agave plantations start farther north. I think these were in Nayarit (ni-yah-REET), the state where we are living. Those Agave plants were a welcome site near the end of a very long drive -- about 49 hours in three days. 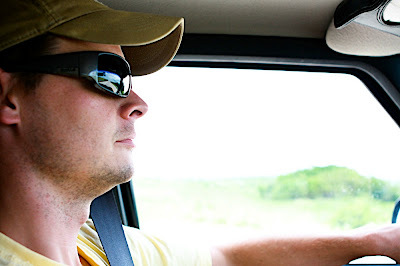 One last shot, of my studly husband (who looks extra studly in his new Bolle glasses) driving us safely to our adopted home. The man's got stamina. He drove the entire time and ate almost nothing. I was pretty much asking for food the whole time. Well, except for when I was sleeping. That's what I did the rest of the time. Scott somehow managed on a Whole Foods chicken wrap, a Jack in the Box breakfast burrito, a coffee, half a chocolate milk, a very large Coke, a few homemade Lara bars (I will share the recipe eventually) and lots of water. Quite a departure from his normal salad-based eating habits. Yet somehow, today, he managed to score a Wii Fit age of...get this...twenty! I don't know how he does it. He's a total stud. I married WAY out of my league! I would first like to comment on the Wii Fit. One time it told me that I was 46 and then the next time was 21. I don't think that uni-gender alien baby knows what it's talking about. Just because I can't stand still for 20 seconds doesn't mean I'm 46 - it's called ADD. So Scott shouldn't let it go to his head. That is unless he's been doing P-90X because then he's earned it. Also, I'm glad you've enjoyed the poor man's Lara Bars - if you make any changes to the recipe to further perfect it, keep me in the loop. Hugs - I'm glad you made it safely! This is fantastic!!! I am thinking about doing something similar. Jules and I may be over in Europe for a couple of years starting next fall. I am so excited for you and your family!!! Jamie -- you're totally right about the Wii Fit. It is inconsistent with me, too. Which is why, after getting down to age 23, I stopped doing the fitness tests! Last time I made the Poor Man's Lara Bar I used apricots, cherries, and cranberries with cashews and almonds and, of course, dates. But I need to record the recipe. It's pretty much a handful here and a handful there. Heather -- How exciting that you and Jules may be heading to Europe! That would be such a great experience for you both, but especially for Jules. He'd soak up SO much! Keep us posted -- maybe we can come visit! 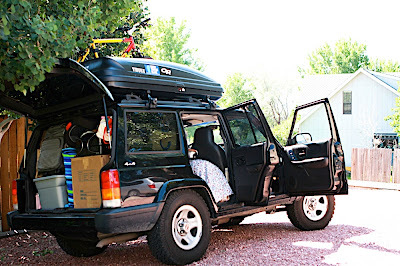 I could so relate to the pictures of the Jeep considering our '99 black cherokee looked exactly the same when we loaded it to the brim for our trip this summer. I look forward to many interesting posts to come. Hey, Alison! We're in a little town north of Puerto Vallarta, Mexico. You're right -- I'll definitely have to post more about our new hometown. With pictures!